Educate the world on the accomplishments of African Americans through video oral history interviews. 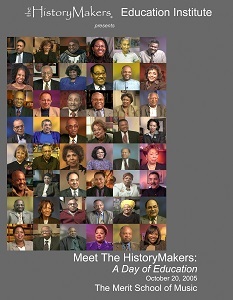 The HistoryMakers is now the single largest collection of African American first person video oral history testimony in the world. A 501(c)(3) nonprofit educational institution, The HistoryMakers is committed to preserving, developing, and providing easy access to its internationally recognized archival collection of thousands of African American video oral histories. By recording the stories of both the well-known and unsung from diverse backgrounds, The HistoryMakers seeks to preserve and elevate the cultural equity of the African American community, as well as to increase the cultural understanding of present and future generations. Over nearly two decades, The HistoryMakers has assembled a collection of over 3,000 and growing interviews (10,000 hours of first person testimony), to educate the world about African American life, history, and culture. The HistoryMakers is a vitally important treasure trove of insights, career paths, role models, and perspectives. These stories, now and well into the future, will provide a more complete understanding of who we are as Americans, as well as where we have come from, and where we are going as a nation. An integral part of the American experience, The HistoryMakers' stories are stories of success against the odds, of achievement in the face of adversity, and of inspiration. Recorded in over 413 cities and towns across the country (and in international locations like Norway and Mexico), the video oral histories in our collection, and in The HistoryMakers Digital Archive, range from 90 minutes to 15 hours in length, and are housed permanently at the Library of Congress, which became The HistoryMakers permanent repository in 2014. • James Earl Jones, and President Barack Obama (while he was still and Illinois State Senator), among thousands of others. The HistoryMakers is incorporated as a 501(c)(3) non-profit organization. Julieanna Richardson supplies money, equipment and office space. Project goal set: complete 5,000 interviews of both well-known and unsung African American HistoryMakers. The HistoryMakers radio series runs on WBBM-AM radio, reaching millions in the Chicago area. 70 Interviews are conducted in Chicago. Three Artists, Three Lives, Three Stories: live event at the Chicago Cultural Center. ABC-7 personality Bill Campbell moderated a discussion with artists Dawoud Bey, Richard Hunt and Allen Stringfellow. 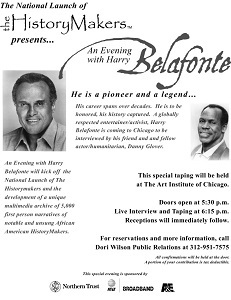 An Evening with Harry Belafonte: the televised program airs nationally on the Public Broadcasting System network and the A&E Network. 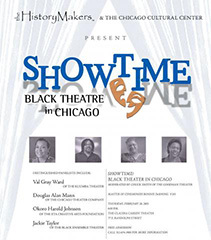 The televised program also premiered at the Chicago Cultural Center. An Evening with Dionne Warwick kick-off reception was held in September at Ariel Capital Management’s new headquarters. An Evening with Dionne Warwick benefit event was held at The Field Museum with live interview conducted by Diahann Carroll. 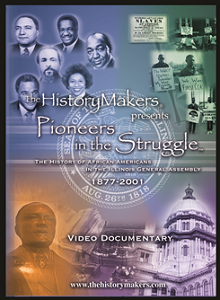 Pioneers in the Struggle: TV documentary tracing the history of African Americans who have served in the Illinois General Assembly since 1877. Live premier screening at the James R. Thompson State of Illinois Building. From this program, an educational video, CD-ROM and curriculum guide is completed for distribution to schools, grades 8-12. Pioneers in the Struggle: teacher training sessions held during the months of June, July and September as well as a presentation to an assembly of 300 State of Illinois school superintendents. Meet the HistoryMakers – A Day of Education: 60 HistoryMakers came from around the country to participate in this event which is attended by teachers, students and librarians. 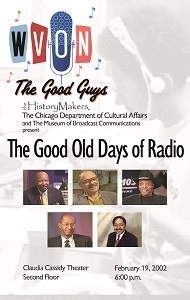 WVON - The Good Ol’ Days of ‘60s Radio: a panel discussion at the Chicago Cultural Center with legendary personalities including Lucky Cordell, Cecil Hale, Herb Kent, Richard Pegue and Pervis Spann. The HistoryMakers is named a special collection as part of the Illinois State Library system. An Evening with Ossie Davis & Ruby Dee: held at the Art Institute of Chicago, the event was taped as a TV program to be aired national on PBS. Meet the History Makers – A Day of Education: HistoryMakers came from around the country to participate in this event held at the DePaul University Conference Center. The first HistoryMakers National Planning Summit convened on July 25, 2003. Footage from The HistoryMakers archive was used in exhibits at the Chicago Museum of Contemporary Art and at The Field Museum. Showtime! Black Theatre in Chicago unfolded at the Chicago Cultural Center, highlighting the contributions of four Chicago theatre pioneers. An Evening with B. B. King: the famous musician is interviewed by Isaac Hayes in a gala event at The Art Institute of Chicago, taped as a television program to be aired nationally on PBS. Sounds of Experience was presented at the Chicago Cultural Center as part of Black History Month. The HistoryMakers, partnered with the Illinois Humanities Council, presented An Evening with Jeni LeGon at the Museum of Contemporary Art Auditorium. 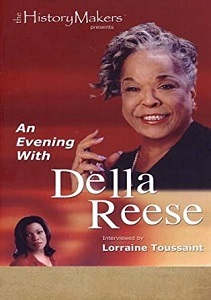 An Evening with Della Reese: the famous music and television personality was interviewed by Lorraine Toussaint at Georgia Public Broadcasting to launch The HistoryMakers Atlanta/Southeast region initiatives. An Evening with Russell Simmons: taped in Chicago as part of The HistoryMakers’ fifth anniversary. Simmons was interviewed by media maven Cathy Hughes, founder of Radio One and TV One. Salutes to The HistoryMakers: Hilton Hotels Corporation hosted three regional Salutes in Chicago, Washington, D.C. and Los Angeles to honor HistoryMakers around the country. McDonald’s Corporation was the awards sponsor. The HistoryMakers hosted its third annual Meet the HistoryMakers – A Day of Education at Northeastern University’s Center for Inner City Studies. Movement in Motion is presented at Harris Bank as part of Black History Month. An Evening with Diahann Carroll: taped in Washington, D.C., Carroll was interviewed by journalist Gwen Ifill. An Evening with Nikki Giovanni: taped in Atlanta, Georgia at Georgia Public Broadcasting, Giovanni was interviewed by writer Pearl Cleage. An Evening with Denyce Graves: taped in Chicago at Northwestern University’s Thorne Auditorium, Graves was interviewed by actress Angela Bassett. The HistoryMakers hosted its fourth annual Meet the HistoryMakers – A Day of Education in Los Angeles. Della Reese and Earvin “Magic” Johnson served as guest speakers for the event. Salute to Brock Peters: The HistoryMakers held a memorial reception celebrating the life of legendary actor Brock Peters at the California African American Museum in Los Angeles. The event was sponsored by the MCI Foundation at the California African American Museum. 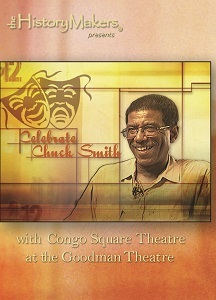 Celebrate Chuck Smith was presented at the Goodman Theatre in which famed theater director Chuck Smith was honored and interviewed by reporter Robin Robinson. The HistoryMakers hosted its fifth annual Meet the HistoryMakers – A Day of Education in Atlanta, Georgia in February. This program was followed by A Salute to Dr. Walter Massey and Dr. Louis Sullivan in collaboration with SunTrust Bank at the George Aquarium. Write On: The Art of the Written Word was presented in collaboration with the Illinois Humanities Council at the Harris Bank Theater as part of Black History Month. Meet the HistoryMakers - A Day of Education was hosted in Chicago, Illinois at the Merit School of Music. An Evening with Colin Powell: taped in Washington D.C., at George Washington University. Powell was interviewed by political commentator and author Juan Williams. An Evening with Andrew Young: taped in Atlanta, Georgia at Georgia Public Broadcasting. Young was interviewed by author and journalist Charlayne Hunter-Gault. An Evening with Earl Graves: taped in Chicago, Illinois. Business mogul Earl Graves was interviewed by civil rights activist Julian Bond. A Conversation to Honor African-American Leaders in the Insurance Industry: featured five insurance industry executives; James H. Speed, Jr., Ronald D. McNeil, Ronald D. Brown, Gregory Jones and James R. Lewis. It was held at the Aon Center in the Indiana Room in Chicago. Samuel C. Thompson, Jr.: An American Life Story was the first annual Wayne A. McCoy Memorial Program sponsored by Schiff Hardin’s Diversity Committee. The University of Illinois and The HistoryMakers announce a three year partnership. A reception was held in the Willis Tower to announce the collaboration. A Conversation with Roland Martin was held at the University of Illinois at Chicago campus. Journalist Roland Martin spoke about the future of education in the United States and took questions from the audience. 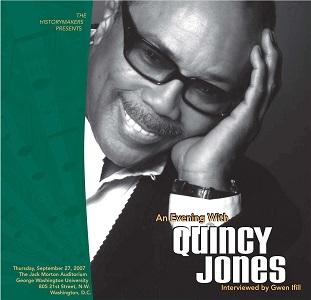 An Evening with Quincy Jones: taped in Washington, D.C. at The George Washington University. 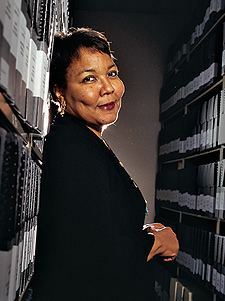 Jones was interviewed by Gwen Ifill. Celebrity guest performers included BeBe Winans, James Ingram, Herbie Hancock, Bobby McFerrin and Lesley Gore. The HistoryMakers interviewed all of the living National Presidents of the Alpha Kappa Alpha (AKA) Sorority, Inc. for the Sponsor-A-HistoryMaker initiative. Justice Leah Ward Sears: An American Life Story was the second annual Wayne A. McCoy Memorial Programs sponsored by Schiff Hardin’s Diversity Committee. A Conversation with Sala Udin: The HistoryMakers’ Oral History Interview was held at the Oral History Association’s Annual Meeting. 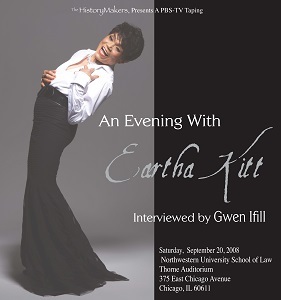 An Evening with Eartha Kitt: taped in Chicago, Illinois at Northwestern University’s Thorne Auditorium. Kitt was interviewed by Gwen Ifill. An Evening with Richard Parsons: taped in Washington, D.C. at The George Washington University. Parsons was interviewed by CNNs’ Soledad O’Brien. The HistoryMakers held public programs on all three University of Illinois campuses called Agents of Change featuring Illinois State Senate President Emil Jones, NAACP Chairman and Civil Rights activist Julian Bond and Ambassador Carol Moseley Braun. In August, The HistoryMakers was awarded a $2.3 million grant from the National Science Foundation to interview more than 180 of the nations’ top African American scientists. The HistoryMakers’ MediaMaker category is named in honor of Herb & Sheran Wilkins in recognition of their $1 million gift to The HistoryMakers. The National Endowment for the Humanities awarded The HistoryMakers a $167,000 grant for the establishment of an in depth Summer Institute for 25 of the nation’s top high school teachers on the subject of African American political history. The Richard H. Driehaus Foundation awarded a $15,000 grant to establish an interactive exhibit entitled Agents of Change on the street level of The HistoryMakers’ office in Chicago’s South Loop. The HistoryMakers is awarded a $5,000 technical assistance grant from The Field Foundation and a $500,000 grant from the Illinois Department of Commerce and Community Affairs. 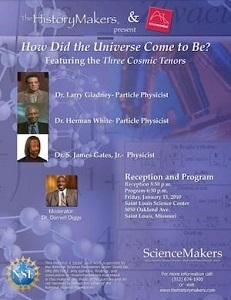 The HistoryMakers held several public programs around science; How the Universe Came to Be at The St. Louis Science Center, The Value of Science: Improving The Quality of Life at the Museum of Science and Industry and Biology: From Molecule to Man at The COSI Center of Science and Industry. Dr. Shirley Ann Jackson and Dr. Walter E. Massey were interviewed as part of the Agents of Change Speaker Series held by the University of Illinois and The HistoryMakers. 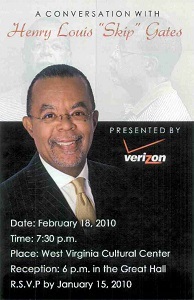 A Conversation with Henry Louis “Skip” Gates, Jr.: taped at The Culture Center in the State Capital of Charleston, West Virginia. Gates was interviewed by Suzanne Malveaux. The HistoryMakers received a $800,000 three-year grant from the Institute of Museum and Library Services titled Increasing African American Diversity in Archives: The HistoryMakers Fellowship, Mentoring and Placement Program. At the 1st Annual Back To School With The HistoryMakers, over 170 HistoryMakers spoke at nearly 100 schools in over 50 cities in 25 states to share with students their stories of perseverance and triumph against the odds. On November 20, The HistoryMakers celebrated its 10th Anniversary at the Art Institute of Chicago. The evening, themed COMMIT: Telling America’s Stories…Celebrating Our Future, featured over 150 HistoryMakers from across the country. A Night With Bernard Harris: taped on March 15, 2011 at Howard University in Washington, D.C. and co-sponsored by ScienceMakers and Exxon Mobil. The HistoryMakers held several public programs focused on the sciences including: The Age of Dinosaurs: Bringing the Past to Life at The Detroit Science Center, The Color of Science at The Franklin Institute and The Nature of the Universe: Engineering the Power of Physics at The COSI Center of Science and Industry. The HistoryMakers began the first year of an Institute of Museum and Library Services grant titled Increasing African American Diversity in Archives: The HistoryMakers Fellowship, Mentoring, and Placement Program. At the 2nd Annual Back To School With The HistoryMakers, over 400 HistoryMakers spoke at nearly 300 schools in over 100 cities in 35 states. 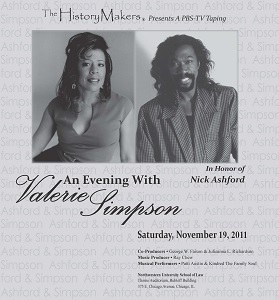 An Evening With Valerie Simpson in Honor of Nick Ashford: taped on November 11, 2011 in Chicago, Illinois at Northwestern University's Thorne Auditorium. Simpson was interviewed by Gwen Ifill and the event was co-produced by Tony Award winner and choreographer George Faison with a band led by Ray Chew and performances by Patti Austin and Kindred: The Family Soul. The First Division Museum at Cantigny Park and The HistoryMakers presented The Untold Story: African Americans in the U.S. Military featuring noted military historian Michael Lee Lanning and African American veterans Colonel (Ret.) Eugene Scott, Charles Harrison and current soldiers of the 1st Infantry Division. A Night With Warren Washington: taped on June 11, 2012 at the newly-renovated National Academy of Sciences' Auditorium in Washington, D.C.
At the 3rd Annual Back To School With The HistoryMakers over 400 HistoryMakers spoke at nearly 300 schools. The HistoryMakers held multiple public programs including Breaking Barriers: African American Women in Science at The Science Museum of Minnesota; Atlanta: Connections in Science at The Fernbank Science Center; Blazing Trails: African Americans in Science, Technology, Engineering and Mathematics at SciWorks and Exploring the Science of Genetics at The COSI Center of Science and Industry. 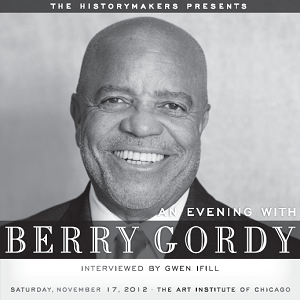 An Evening With Berry Gordy: taped on November 17, 2012 at The Art Institute of Chicago. Gordy was interviewed by Gwen Ifill and the event was co-sponsored by Motown Executive Suzanne De Passe. The First Division Museum at Catigny Park and The HistoryMakers presented Leadership In Action on February 20, 2013 featuring Lt. Gen. Russel L. Honore. The Chicago Military Academy at Bronzeville and The HistoryMakers presented Leadership in the New Normal featuring Lt. Gen. Russel L. Honore. An Evening With Ursula Burns: taped at The New York Times Center on April 13, 2013 in New York. Xerox CEO Ursula Burns was interviewed by Gwen Ifill and $1.1 million was raised to support The HistoryMakers' efforts. On September 27, 2013, The HistoryMakers hosted its 4th Annual Back To School With The HistoryMakers program. 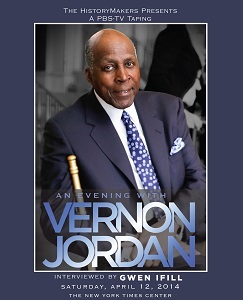 An Evening With Vernon Jordan: taped on April 12, 2014 in New York City at The New York Times Center. 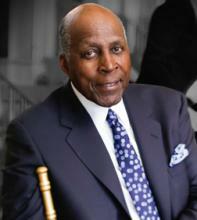 Vernon Jordan was interviewed by Gwen Ifill. On August 18, 2014, The HistoryMakers was awarded a $1.6 million grant from the PricewaterhouseCoopers Charitable Foundation to transcribe, process and add to The HistoryMakers Digital Archive 2,000 video oral history interviews. September 26, 2014 was the 5th Annual Back To School With The HistoryMakers. On the evening of November 7, 2014, guests of An Evening With The HistoryMakers (Act II) Readers Theatre were treated to an intimate evening of memory, reflection and song at Studio Theatre in Washington, D.C. The HistoryMakers Education Symposium: Digital Humanities Meets The Black Experience, held the morning of November 8, 2014 at The George Washington University's Jack Morton Auditorium in Washington, D.C. explored the contributions of The HistoryMakers to the world of education. On November 8, 2014, The HistoryMakers two days of events in Washington, D.C. culminated with An Evening With Gwen Ifill In Celebration of the Announcement of The Library of Congress as the Permanent Repository for The HistoryMakers Collection. The HistoryMakers flew the winners of The HistoryMakers Digital Archive Competition to Comcast NBC Universal's headquarters in Philadelphia, Pennsylvania on May 26, 2015 for a special awards luncheon. On July 16 and 17, 2015, The HistoryMakers convened The HistoryMakers National Advisory Board Planning Summit at the Palmer House Hilton in Chicago, Illinois. At the 6th Annual Back To School With The HistoryMakers program on September 25, 2015, nearly 400 HistoryMakers spoke at 200 schools across the national to share their stories with students. 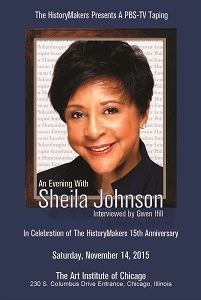 An Evening With Sheila Johnson: taped on November 14, 2015 in Chicago, Illinois at the Art Institute of Chicago. On December 14, 2015, The HistoryMakers was granted $200,000 from the Ford Foundation to identify, research and interview 40 high-priority HistoryMakers in New York City. • On March 10, 2016, The HistoryMakers received word that an Andrew W. Mellon Foundation grant for $725,000was approved by the Mellon Foundation's Board of Directors. 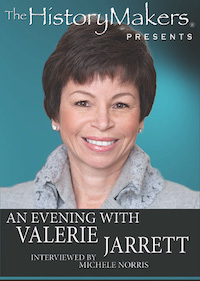 • An Evening With Valerie Jarrett: taped on April 9, 2016 in Chicago, Illinois at the Art Institute of Chicago. The event was The HistoryMakers' largest Chicago fundraiser to date. • On April 24, 2016, The HistoryMakers convened its first in-person Higher Education Advisory Board meeting in New York City. • On September 13, 2016, The HistoryMakers was awarded a $100,000 grant by the Robert R. McCormick Foundation to redevelop the front end of The HistoryMakers' public website and online presence. • The HistoryMakers traveled to Atlanta for a Salute to Atlanta HistoryMakers on October 4, 2016 at The Carter Center. • An Evening With Eric Holder: taped on October 15, 2016 in Washington, D.C. at the George Washington University's Jack Morton Auditorium. • A Night With Mayor Sylvester Turner, In Salute To Houston HistoryMakers was a one-on-one interview with Houston Mayor Sylvester Turner and hosted by ChaseSource CEO Anthony Chase. • On February 2, 2017, the City of Chicago and the Chicago Public Library hosted a special press event at the Harold Washington Library to announce the offering of The HistoryMakers Digital Archive free of charge to all Chicago library patrons. • On February 5 and 6, 2017, The HistoryMakers held its second Higher Education Advisory Board meeting in New York City. • The HistoryMakers held several special receptions to honor HistoryMakers in cities across the country including Miami, Florida; Dallas, Texas; Birmingham, Alabama; Milwaukee, Wisconsin; New Orleans, Louisiana; Jackson, Mississippi; Denver, Colorado and Columbus, Ohio. • Hosted by actress/director Regina Taylor and actor/producer Harry Lennix, An Evening With The HistoryMakers: Chicago Stories was taped on April 22, 2017 at the Art Institute of Chicago. • For the first time, The HistoryMakers exhibited at the American Library Association conference and at the Association for the Study of African American Life and History conference where they also hosted a roundtable discussion entitled The HistoryMakers: Answering Woodson's Call Through the Digital Humanities. • On August 15, 2017, The HistoryMakers hosted a program and panel discussion on Martha's Vineyard in partnership with the Martha's Vineyard Museum and Toyota Motor Sales. 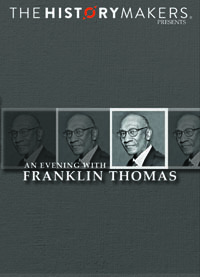 • An Evening With Franklin Thomas: taped on November 11, 2017 at the AXA Equitable Center in New York City. • On December 18, 2017,The HistoryMakersco-sponsored a select screening of 'Revival!' at the DuSable Museum of African American History in Chicago, Illinois. 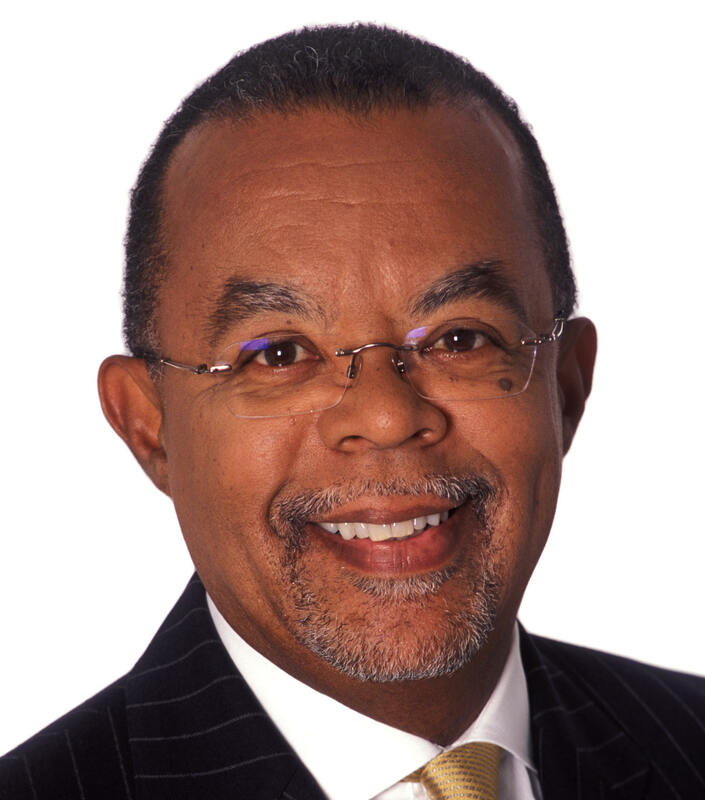 Henry Louis “Skip” Gates, Jr.